Flavours Indian Cuisine uses their own specialised couriers to deliver their food. Dal is a flavourful combination of three lentils with onion, tomatoes and Indian spices. Potatoes and cauliflower cooked with onion, tomatoes and spice in a popular Indian recipe. Made by cooking a mixture of vegetables together in a traditional Indian tomato gravy. Potatoes and eggplant cooked with onion, tomatoes and spice in a popular Indian recipe. 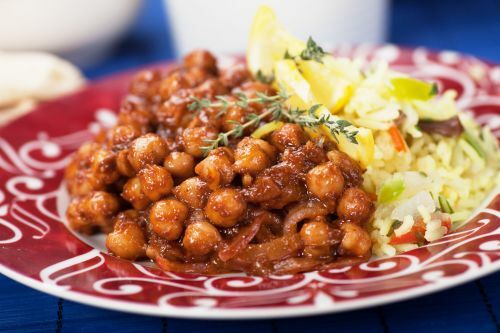 Boiled chickpeas cooked in onion and tomato gravy with ground Indian spices. Black lentils simmered in a slow fire overnight and tempered with onions, garlic, tomatoes and cream. Mixed vegetables cooked with creamy sauce and almonds. Peas and mushrooms cooked in a tangy cumin gravy with fresh tomatoes and coriander. Indian cottage cheese cooked with creamy sauce and almonds. Chunks of Indian cottage cheese cooked in a creamy tomato and almond gravy. Chunks of Indian cottage cheese cooked with spinach. Indian cottage cheese with onion, tomato and finished with a hint of ginger and garlic. Potato and ricotta dumplings in exotic tomato and creamy cashew nut gravy. Indian cottage cheese pan-fried with capsicum, onion and tomatoes. Chicken thigh tandoor-cooked cashew and fenugreek flavored tomato sauce. Boneless chicken pieces cooked with cream and almond. Chicken marinated in yoghurt, turmeric and a paste of red chillies, coconut and many Indian spices. Boneless chicken cooked with onion and tomato sauce. Traditional Goan dish with a fiery red colour and slightly tangy from vinegar. Boneless chicken pieces cooked in mild spices and Alphonso mango pulp. Boneless chicken cooked with cracked pepper and hint of lemon. Chicken cooked with fresh onions, tomato, capsicum, green chilli and a touch of vinegar and finished with chilli. Lamb braised with gravy flavored with ginger garlic. Lamb cooked with creamy sauce and almonds. Lamb cooked with chunky onions and onion gravy. Goat marinated in chilli and turmeric, finished with pepper and coriander powder served on the bone. Goat cooked with chunky onions and onion gravy. Beef cooked in onion gravy with the hint of fenugreek leaves and seeds. Dry beef curry cooked with onion,tomato and spices. Rich hot spicy beef dish soaked with capsicum, mustard seeded and laced with coconut milk. Beef cooked with creamy sauce and almond. Style with coconut cream, oil and South Indian spices fish cooked in Kerala. Barramundi fish infused with mustard and kokum in a coconut gravy. Stir fried prawns tossed with garlic, capsicum and onions. Prawns cooked in Kerala style with coconut cream, oil and South Indian spices.